In the second half of the 19th century the massive fortification of the city of Olomouc was planned and gradually built. 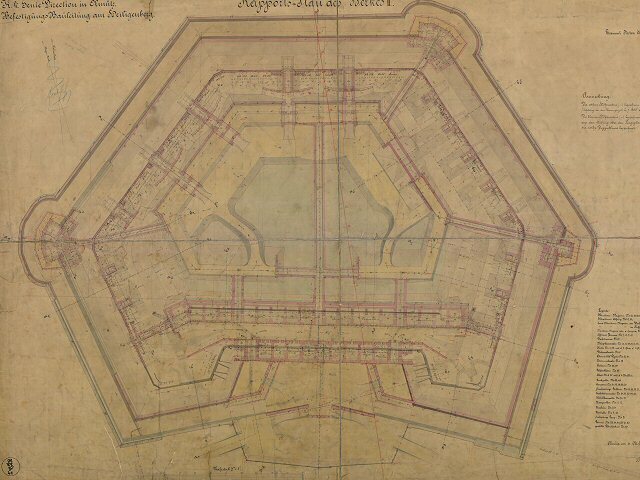 One of the complexes of that fortification was Fest Svatý Kopeček, which was to include four principal forts: No. I Toveř (near spot height 418), No. II Radíkov (spot height 444, Zdiměř), No. III. Lošov (near spot height 375), No. IV. Droždín (near spot height 335) and two artillery batteries, A and B. However, only one of the forts, Fort Radíkov, was built (1871-1876). The other forts were redesigned into simpler structures to be built quickly in case of a war threat. Fort Radíkov was built according to the design by Captain Karl von Peche, who was employed by the 8th Department of the Empire Ministry of War in Vienna. Its irregular hexagonal ground plan, reminiscent of a lunette with an obtuse front and a bastion-shaped gorge, can be divided into two parts – the open gun posts on the perimeter rampart and the rear part consisting of two rectangular casemate buildings of dimensions 8 × 60 and 8 × 80 m, which served as the barracks at the gorge for the planned garrisons of Fort Radíkov, consisting of 11 officers and 800 men (in the period documentation, the inner casemate building is called “Parados Building” , while the outer one is called “Gorge Building”). Both structures were single-storey buildings with flat roofs built of quarry stone and bricks of fortification format. Their interior spaces were protected against enemy bombardment with a durable barrel vault of brick, covered with 30 cm of concrete (the data is based on the preserved building documentation, the remaining buildings are mostly more modest) and covered over with a thick layer of soil. The main armament of the fort was to be deployed in open gun posts on the perimeter rampart protected from the front with an earthen parapet and separated from each other by the hollow traverses. There were ramps for the transport of the cannons from the rampart path to the traverses. The traverses lead onto two-storey casemate serving as an emergency ammunition depot, from which the ammunition was transported to the hollow traverses by elevator shafts. In total, up to 26 cannons could have been placed in the open emplacements called barbettes at the sides and at the front of the fort, although the full use of all the cannons was mostly not considered. The space in front of the fort’s gorge was a large gathering area which was protected by armament placed on the bastion-shapes gorge. On the wings of the gorge there were six posts for field cannons to protect the fort’s rear, while on the both inner sides of the bastion-shaped gorge there were other four posts for the artillery armament to protect the gathering area located immediately in front of the entrance. Due to its elevated location, Fort Radíkov was surrounded by a dry ditch cut in the rock, the depth of which was 15-20 m from the ridge of the perimeter rampart to the bottom. Both, scarp and counterscarp, were reinforced with quarry stone, and the corners were reinforced with cut stone blocks. Only where there was sheer rock, could the construction work be limited to a mere hacking of the rock into a vertical wall. The two inner caponieres on the left side and at the front of the fort, and one caponiere on the right side of the fort secured the defense of the perimeter ditch by flanking fire. They protruded from the scarp wall onto the ditch and were connected with the interior spaces of the fort through separate posterns across the perimeter rampart. The two posterns therefore came out symmetrically from both sides of the inner courtyard of the fort, while the third postern proceeded from the right front courtyard. All three caponieres were connected to the inner barrack casemates (Parados building) via a covered passage (gallery) running around the inner courtyard from which emerged all the three posterns to the caponieres, while the gorge of the building was the gallery accessible by three passages in the Parados building (in the capital on both sides). From there also ramps lead to the rampart path along the perimeter of the fort. All the caponieres were built mainly of quarry stone. The lining was built of carefully cut stone blocks. The bricks were used only to reinforce the interior spaces, posterns and various precision elements (infantry embrasures, ventilation holes). There were two embrasures directed in each firing direction of every caponiere, so in total ten cannons were to defend the perimeter ditch. Despite the abandonment of the construction of the outer caponieres and deep posterns, it was still necessary to carry out extensive blasting and mining work in the rocky bedrock of the hill. According to the Order of the Empire Ministry of War, all this work was planned in 1872 to be done by the engineering units of the 1st Engineer Regiment located in Olomouc, which at the same time was cheaper and faster than if it had been given to a private entrepreneur. Additionally, the construction helped to deepen engineer training. To this end, an engineer troop composed of one officer, four non-commissioned officers and 52 soldiers was created in the Olomouc fortress and was later extended on October 13 of that year to 109 engineers. These were divided into groups that worked on daily twelve-hour shifts. The Radíkov ridge, on which the fort was built, consists of a hard grey stone, rich in feldspar and chlorite, interlaced with layers of clay. The cover layer of the soil and the weathered layer of rock were only slowly broken down and removed by civilian workers. Among them were the Italians who founded families here. Italian surnames, such as Krososka and Rella, are still to be found in the Radíkov neighbourhood. The extremely hard bedrock had to be removed by blasting. This was done by drilling and gradual blasting off individual layers of the rock with the clay interlayers being manually broken and washed away with water. A major problem was the construction of the perimeter ditch, where the excavation proceeded in parallel with the rock layers, hence they could not be removed as described above. So other techniques had to be used such as a strong sloping or perpendicular overflowing of the layers and falseworking with 2-inch planks and 10-inch beams until the stone reinforcement was fully built. 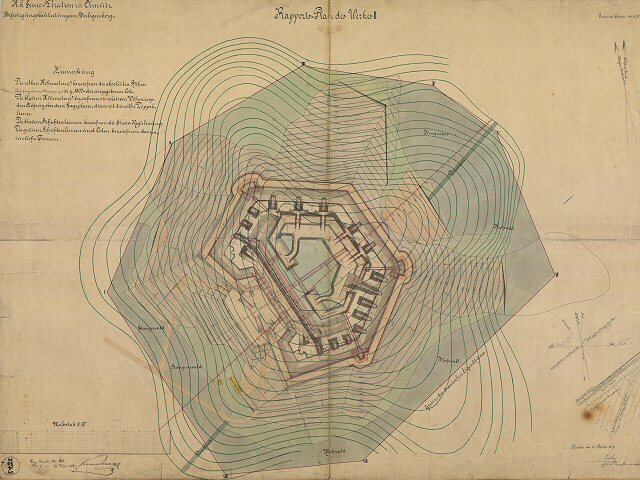 Mining work on Fort Radíkov was carried out in order to establish three types of underground space – non-reinforced galleries with a width of about 100 cm and a height of 180 cm, and non-reinforced or reinforced (with stone) spaces with a width of almost 450 cm and a height of 320 cm. The reinforced space can be further divided into that which should have resisted only the pressure on the ceiling and that which should have resisted pressure on the sides, too. The smallest profile non-reinforced underground gallery, 27 m in length, was driven only on the right side of the fort to serve as a drainage gallery. Such small profile galleries were also used as directional galleries for building galleries and other space of larger dimensions. Two large profile galleries, more than 15 m in length, connected the interior spaces with the side caponieres and at the same time served as drainage galleries. Another postern went through the capital of the building to the caponiere on the right side of the front, and other galleries went through the fort on the right and the left sides. The total length of the galleries of that profile reached a length of 133 m in Fort Radíkov. Mining work was based on the use of explosives, when the holes for dynamite cartridges were drilled using steel and cast iron drills operated by one, two or three men. Some holes were made manually. In some cases, gunpowder was used in addition to dynamite. Dynamite was more resistant to moisture, but gunpowder was significantly cheaper than dynamite. A cent of dynamite cost 133 Guldens, while the gunpowder cost only 33 Guldens. Bickford fuse, both the ordinary version and with a rubber cover, was used to set off the explosive. During a twelve-hour shift, a large profile gallery progressed in length by an average of 32 cm, while a small directional gallery, if pre-drilled, by less than 25 cm. 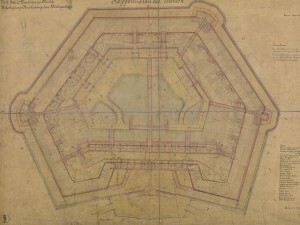 By 1876, Fort Radíkov had been built for the most part, but had not been completed. The construction work on the fort was definitively ended by the shift in relations with Germany, against which the fort was actually being built. However, the building documentation of 1881 showed a residential building (for 80 soldiers), which became a gathering place in front of the fort’s gorge.